Mayflies spend a year awaiting their birth, and then most die after living just one day. Their sole purpose is to pass on their genes, and most never even bother eating...and that's been the status quo for 100 million years. 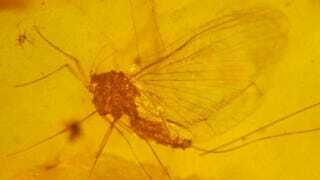 An ancient mayfly became trapped in amber all those millions of years ago, and her preserved remains speak to the pointedly pathetic of her species and its modern equivalents. This particular mayfly had an ovipositor, which is a structure or mechanism that insects need to place their eggs on a specific location. While other insects still have ovipositors, no living mayfly species possesses them. "This is the first time we ever documented such long antennae and an ovipositor in this order of insects. This species is now extinct. It probably had to lay its eggs on a certain type of substrate or habitat that disappeared, and the species disappeared with it. It's not good to be too specialized." "After their mating flight mayflies are usually dead by the end of the day. There's only one thing they really care about on that one eventful day, and it's not eating. They don't even have functional mouth parts." If you think of evolution as maximizing one's imperative to pass on genes and continue the species for another generation, then I guess you could call these mayflies the most highly evolved species in existence. After all, their entire existence is consumed with mating and reproduction - they're only born when they're ready to mate, and they die as soon as they're done. They have even evolved a natural immunity to life's little distractions, like, you know, eating. Honestly, I can't even imagine a more miserable existence than this, even if you are mating for life.